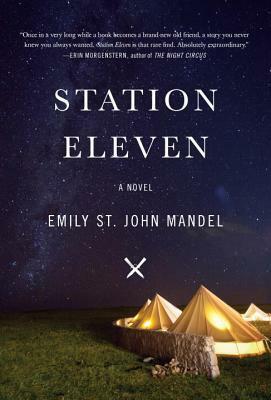 Station Eleven follows the storylines of four main characters. Their stories span from thirty years before the Collapse to twenty years after it. The Collapse refers to the Georgia Flu pandemic that spread around the world in a matter of weeks and wiped out most of humanity. What remains are sporadic communities where most of the inhabitants stay put and do the best they can with what they have. … the more you remember, the more you’ve lost. Arthur. The characters’ lives are loosely connected to one another through the well known actor, Arthur Leander. Arthur went from a quiet childhood on a small island off the coast of British Columbia to the fame and fortune of life in LA. We see snapshots of his life as he moves to the big city of Toronto, takes acting classes, becomes a well known actor, falls in love with Miranda, Elizabeth, and Lydia, who eventually become his three wives. He is a kind man, but restless. He is not happy with the mistakes he has made in his life, but doesn’t quite know what to do about it. His first wife, Miranda, is an artist who spends a lot of her free time creating a graphic comic about a space station called Station Eleven, which plays a big part in this story. His second wife, Elizabeth, is the mother of Arthur’s only child, Tyler. The night of Arthur’s death is where the story begins. His is on stage at the time, acting as King Lear, when he has a heart attack. Present that night is a little girl named Kirsten, who will always remember it, and a man named Jeevan who jumps up on stage to administer CPR to the 51-year-old actor. This significant event quickly becomes irrelevant as the Georgia Flu makes its way through the city of Toronto that very day and changes the world forever. Kirsten. Kirsten doesn’t remember much about the world before the Collapse. She has vague memories of being a child actor, and of the death of Arthur Leander who was kind to her. She has always kept the comics he gave her on that last night, and loves collecting any kind of gossip/entertainment magazine she can find in abandoned houses and buildings, especially if they have anything to do with Arthur Leander’s career. Now, twenty years after the Collapse, Kirsten belongs with the Travelling Symphony as one of the actors. The Symphony travels from community to community , bringing music and entertainment to people in this new world. In one particular community, though, things aren’t what they should be, and the Symphony leaves quickly, hoping to be left alone. But, then members of their group begin to disappear. It is through Kirsten’s story that we find out the most about the world after the Collapse. Jeevan. Jeevan had worked long enough in the entertainment industry. He longed to do something more meaningful, like become a paramedic. On the night he jumps onto the stage to help Arthur Leander during his heart attack, he walks home in the snowstorm, excited about his future. Then he gets a phone call from his friend at the hospital telling him about all the flu patients coming in that day. The hospitals are full to overflowing. He should get out of town. He heads to his brother’s apartment building with several grocery carts full of supplies, where he stays for the next few months; just the two of them. Together they watch the world fall apart on the TV news, day after day, until finally there is no more news. The TV stations sign off, the electricity goes out, the water stops running, the roads are full of abandoned cars, the city is dark and silent. Finally, their supplies run out, and Jevan is forced to leave. Through Jeevan’s story we find out more about the lives of the children after the Collapse. The ones who never knew what the world was like before. There are schools, and the parents get together and discuss whether or not the children should even be taught about the old world. Is it important and helpful for them to learn about it, or detrimental? Clark. Clark is Arthur’s best friend from his acting school days in Toronto. He is in Arthur’s life on and off all through the years, but the real part of his story comes during and after the flu pandemic. He is on a plane when the authorities decide to start shutting everything down to help control the spread of the virus. His plane is re-routed to Severn City airport, along with several others from other parts of the world. Then, they are just left there to fend for themselves. At first, they wait, in the hopes that someone will come rescue them, but they soon come to realize that this is it. Their new home. Unless they want to set out on their own to explore. Clark stays. His story helps us to imagine what it would be like to have to change your mindset from the before to the after. They swore at airport management, at the TSA, at the airlines, at their useless phones, furious because fury was the last defense against understanding what the news stations were reporting. Beneath the fury was something literally unspeakable, the television news carrying an implication that no one could yet bring themselves to consider. It was possible to comprehend the scope of the outbreak, but it wasn’t possible to comprehend what it meant. Elizabeth was also on that plane with her son, Tyler. After two years, Elizabeth and Tyler decide to leave with a religious cult that was travelling through at the time. One thing Station Eleven does well is explore the existence and importance of art and culture before and after the apocalypse. Before the Collapse, the book is filled with characters who are actors, writers, photographers, and artists. After the Collapse, some of the people are still driven to create newspapers, libraries, museums, and, of course, the Travelling Symphony which is full of actors and musicians. Sometimes the Travelling Symphony thought that what they were doing was noble. There were moments around campfires when someone would say something invigorating about the importance of art, and everyone would find it easier to sleep that night. At other times it seemed like a difficult and dangerous way to survive and hardly worth it, especially at times when they had to camp between towns., when they were turned away by gunpoint from hostile places, when they were travelling in snow or rain through dangerous territory, actors and musicians carrying guns and crossbows, the horses exhaling great clouds of steam, times when they were cold and afraid and their feet were wet. Or times like now when the heat was unrelenting, July pressing down upon them and the blank walls of the forest on either side, walking by the hour and wondering if an unhinged prophet or his men might be chasing them, arguing to distract themselves from their terrible fear. Although the characters are all connected, it is a loose connection, and it is good to keep this in mind while reading. Don’t expect any big revelations at the end of the book. By the end, you will already have figured out how everything is connected. The story ends quietly, thoughtfully, and with a glimmer of hope for the future. I highly recommend it, even for those of you who don’t usually read apocalyptic fiction. This one is different. Get a look at some of Emily St. John’s other work on her website. This review in the National Post loosely compares the Georgia Flu and the Ebola virus, as well as goes into more depth about the way Mandel uses art and culture in her novel. Station Eleven is a finalist for the National Book Award this year. You can see all the finalists here. Watch this video of people on the street telling the interviewer what they would miss in a post-apocalyptic world. What would you miss? Would you be the type to want to settle down in one place, or would you want to travel around and explore the new world? Sounds like a must read, have read some interesting thoughts on this, even from the reluctant due to the hype. From the first time I saw this book, it sounded like one I wanted to read. Then, I forgot about it for a little while until I saw it reviewed on The Gilmore Guide To Books. After reading her review, I knew I wanted to read it. And, it didn’t let me down. I thought the way she concentrated on several different characters and kept jumping back and forth in time made the story more interesting. My attention never wandered. It’s worth the attention it’s getting. I’m so glad you posted this! I just bought this for my kindle yesterday, I can’t wait to read it! Oh, I hope you like it a s much as I did! Can’t wait to hear your thoughts! I’ve heard so many good things about this book but I’m not a big fan of dystopian fiction. Reading your review though, this sounds quite thought provoking, and maybe reading it would help me to answer the question you posed, something I’m not even creative enough to consider! I also liked the passage that you quoted. Did you enjoy her writing style? When I first started reading this book, I wondered about how she decided to start it off. I wondered what the point was and how everything fit together. But, it wasn’t long before I was just enjoying the story, whether or not there would ever be a point to it. Which, of course, there was, and things started to connect. In the end, I loved the way she jumped around and made me work a bit to fill in the gaps. One of the characters is so loosely connected, he didn’t even need to be in the book, except that his story was actually one of my favourites. Each perspective gave me new information and experiences. I would definitely recommend it to people who don’t read dystopian, because this book is about more than the apocalypse. All this to say that, yes, I liked her writing style. Her writing is what sets it apart from other dystopian novels (except for Margaret Atwood’s- hers is good too!). Having recently started re-watching ALL of Gilmore Girls on netflix, I’m sold if its mentioned on their guide. I gotta finish a Caitlin Moran – but maybe this will be my next read! Have you read Anthony de Sa? The Gilmore Guide To Books is a book blog that I follow. She’s very prolific and her reviews are thorough. At first, it made me think of the Gilmore Girls, too! I loved that series. I still think you would like the book, though. Which Moran book are you reading? I hear How To Build a Girl is very good. Yes, I have read De Sa’s Kicking the Sky, and you can find my review in my review index, if you want! Thanks for commenting! I was just over on your blog, and your recipes look wonderful! I can’t wait to have a better look at them! You make this sound extremely good. And I’m glad that you wrote about the spilt narratives. I like to be “forewarned”. I’m not always in the mood for that but it sounds as if she did a great job. Great review. Thanks! Yes, not everyone loves the split narratives and the jumping around, like I do. But, when you are in the mood, I hope it will be worth it for you! Thanks for the review. I just added it to my long list of books to read. I’ll order it soon. You are a convincing writer. Haha! Maybe you wish I wasn’t so convincing. I know I am secretly relieved when I read negative reviews about books, so I won’t have to add them to my list. That doesn’t happen often, though! I love dystopian fiction. I love Shakespeare. I WANT THIS BOOK! 9 weeks to Christmas, it’s going on my gift list! I’m so intrigued by this book but just like I have an issue with CanLit (something I swear I’m working on), so too do I have problems reading apocalyptic books. I raelly do not like the idea that the world as we know it could vanish like that and that we’d all have to figure out a new way of life. It intrigues me, especially this review (and the cover is so beautiful it’s almost enough to read it), but I just don’t know! I’m not a huge fan of dystopian fiction, but this one sounds very interesting. I actually thought about the Ebola virus before you mentioned it towards the end of your review. And a quiet ending can sometimes be more thought-provoking than a big revelation. I thought the ending was very fitting for the book. A big ending wouldn’t have rung true, I don’t think. Yes, the flu pandemic in the book doesn’t seem too far out there, does it? Great review! I have Station Eleven on order, so should be coming in soon. I’ve read so many reviews for this book and had no idea it was set in Toronto! I know. The publicity so far hasn’t focused on the fact that this book is Canadian. The author lives in the US now, is from BC. Some of the book takes place in NY, LA, and the US side of the Great Lakes, but a lot takes place in Toronto. I had only read a couple of reviews before reading this book, so I’ll be curious to know if reading all the reviews first affects your thoughts on the book. I hoped it would be good, but I didn’t expect it. I hope you like it! I was interested in the plot right away, so I’ve mostly skimmed the reviews because I didn’t want too many details. I’ve liked all the dystopians I’ve read so far this year and the consensus about this book seems to be everyone likes it. I look forward to reading it, so we can compare notes! I know I’m commenting on this super late, but I JUST finished reading Station Eleven today (it took me long enough) and I just have to say that I found the revelation of the prophet (heh heh) to be VERY surprising! I feel like maybe I should have been able to guess who the prophet really was, but when it was revealed I was shocked. What a fabulous read! It’s one of the rare books that has a stunning beginning and fantastically strong ending as well. I’m glad you were finally able to read it, Karen! I agree – I loved just about every part of it. The ending was just right, and I think that would be so hard in a dystopian novel (or any novel, really). Good question! I feel like, in a way, it would be easier not to know what it was like before. It wouldn’t be as sad, and would feel more normal. That’s true, it would make the new world natural, not something that has to be accepted and will always be compared with the previous version. On the other hand I’d like to preserve the old world at least in memory and stories passed to kids.